Only 1 left in stock--order soon (more on the way). Buy this book with XML: Your Visual Blueprint for Building Expert... by Emily A. Vander Veer today! Average Customer Review: based on 2 reviews. If you have any java programming experience whatsoever, this book is not for you. Even if you have no java experience, this book is not for you because its code examples are horrible and half of them do not even work. The first 1/3 of the book details how to write overly simplistic programs and files in java and xml. However, when you get to the part of the book that actually goes into what you want to learn, it provides very few details, sometimes only a page of text dedicated to a topic. This book takes the very basics of java and the very basics of XML - but if you hope to do anything further than write "Hello, World" to an XML file and then read "Hello, World" back into an object - this book is definately not for you. And if you are a beginner, consider other texts. Well, i dont have much to say about this book. 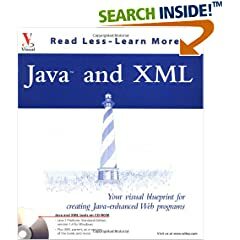 if you want to learn java and xml and you dont have lot of experience with java, this book will give you a helping hand. however, if you do have a fair amount of experience, then this book will be a little too novice style esp. since it begins with an introduction to java language itself. Never misplace your reading glasses again with the hip and stylish magnetic readers from CliC.